The Revitalization of Kennedy Park began in 2008, when the Municipality of Trent Hills received a Municipal Fund grant from the Community Foundation to hire a consultant to create a master plan for the revitalization. The plan would have three phases: the first phase was to re-allocate the soccer fields to be more conducive to soccer play, to add parking spaces, and to build a state-of-the-art skatepark. The second phase would see the creation of a vibrant playground for young people and adults alike, and the third phase would focus on the addition of a spectacular splash pad. Our “Skatepark story” exemplifies how a community foundation works to make great things happen locally, with its hands-on, local focus and its agility as a funding resource and community partner. The Skatepark Group had been formed by community members who wanted to see a new skatepark built in Campbellford. They were in their fifth year of fundraising but needed help to take their fundraising efforts to the next level. That is where a Community Foundation can really help, and we are happy to have been able to support the skatepark project in several ways. 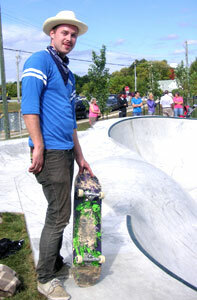 In 2009, the Municipality of Trent Hills and the Community Foundation agreed and made a first-ever strategic fundraising decision to provide matching grant funds from the Municipal Fund and the Community Fund, with all funds raised going to the Skatepark. This meant that for every dollar, three dollars were raised. With the matching funds arrangement, the Skatepark Group was able to raise $375,333.46 and fully meet the cost of the Skatepark. The stunning Skateboard Park was completed in 2009, and at the Grand Opening on September 26 of that year, it drew praise for its beautiful and imaginative design. With a street area of 3,850 square feet and a 2,550 square foot bowl, our Skatepark has been described as “a feast for the eyes…not to mention the wheels.” Jim Barnum, President of Spectrum Skatepark Creations Ltd., went on to say that Campbellford could very well be home to Canada's most unique skatepark bowl. While small, it’s packed with enough features that it has drawn the attention of dedicated “rippers” from Toronto to Ottawa. Three Playgrounds & Fitness Parks in one day! Phase Two of the Kennedy Revitalization Project focused on building playgrounds and fitness parks across three communities. The Campbellford Seymour Foundation formed the Trent Hills Playground and Fitness Park Committee with volunteers from each of the three communities to engage our amalgamated communities to focus on bridging our rural gaps by inspiring grassroots community spirit. We applied to the Let Them Be Kids organization on behalf of the community, and subsequently received an award for 50% of the funding to build the three new playgrounds and the three outdoor adult fitness parks in the three amalgamated communities. We also received a Kool-Aid Award, one of only 10 in Canada, which provided a further $5,000 towards the equipment. Committee members organized 22 fundraisers and obtained cash and in-kind donations from businesses, service organizations and individuals in the community. In summary, our communities came together with over 250 donations and four grants. Our “Community Build Day” was held on September 4th, 2010. Our playground and fitness park phase was completed with help from three hundred community volunteers, no less! The third and final phase of the Kennedy Park Revitalization Project, the construction of the Splash Pad started in the fall of 2011. The Campbellford Seymour Foundation and the Municipality of Trent Hills committed $100,000 each in the form of a matching grant for all donations, which meant that for every dollar, three dollars were actually raised. In fact, we raised and matched over $128,000 and as a result the Splash Pad is named the Campbellford/Seymour Community Foundation Splash Pad. Four signs were installed to high-light donors and supporters of each of the 3 Phases of the project as well as tell the Kennedy Park Story. Three Benches were installed through donations from Hillcrest Public School with proceeds from their Annual Festival of Trees Event, Nick and Paula Meier and Hugh and Gloria McClure. 14 Trees were purchased and dedicated in honour of, or in memory of, loved ones. 2” x 12” bricks and 6” x 12” bricks purchased by families, businesses, community groups surround the CSCF 10th Anniversary Continuum Bench. Through a 2nd year award of 50% grant funding from Let Them Be Kids, garbage receptacles, a bike rack and the continuum bench were added to the park. Three shade shelters and accessible picnic tables were also added a year later. With the completion of the Splash Pad, the Kennedy Park Revitalization Project is now finished. We continue to be inspired by the members of our community who provided gifts and who participated in this extraordinary revitalization project that spans three communities. This has truly been a community success story! In celebration of our 10th Anniversary in the community, the Community Foundation purchased a “continuum bench,” the first of its kind in Canada. The bricks that surround the bench depict donor support for the revitalization project. Some donors purchases trees and benches, which are adorned with dedication plaques. This unique bench will provide a welcoming, pleasant spot for family and friends to spend time, enjoy each other’s company, and maybe tell a story or two.